1 big thing: Bolton's plan to be Trump's "enforcer"
John Bolton knows he's being portrayed as a warmonger as he becomes national security adviser, but he's trying to build internal credibility with a more studied, lower-decibel approach, according to people familiar with his thinking. Bolton's forest of op-eds trumpet his hawkish views. But my sources say that at least at the outset, Bolton plans to rein those in — aiming to be seen more as an honest broker for the war cabinet, and less as blatant advocate. "When the president makes a decision, obviously the principals on the National Security Council are supposed to carry it out," one source familiar with Bolton's thinking told me. "But it's the job of the national security adviser to be the enforcer and to make sure that it happens." Bolton, a former litigator, sees Trump as his client, according to one source: "For a corporate client or even an individual, you have to be absolutely objective about what the strengths and weaknesses of your case are." The source continued: "You've got to be able to lay out for the client where the pitfalls are, what the possible returns are, what the possible risks are in the litigation, so that the client can make a decision." Bolton sees the job as "making sure the president knows what the cost-benefit analysis of the various options is going on — and then, coming out, making sure that the decision is enforced," the source said. 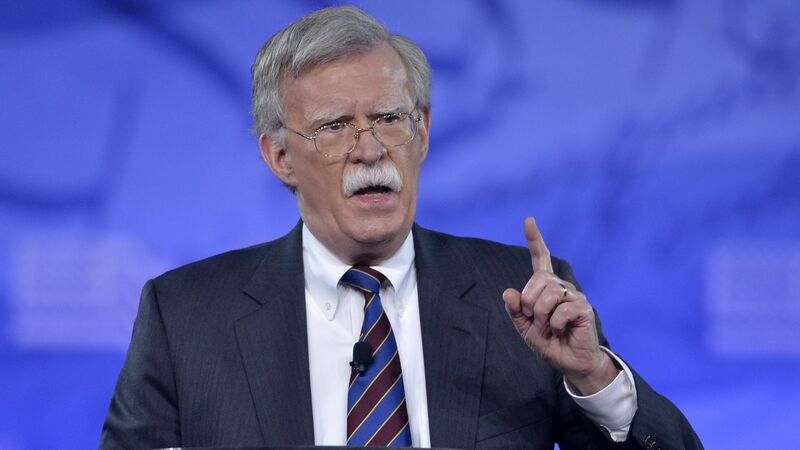 Look for: Bolton to be aggressive about the traffic-cop role of the NSC adviser. Bolton plans to insist that the State Department and Pentagon do a better job of participating with the White House in the "interagency process" of hashing out decisions. Those channels are currently a mess because of the mutual contempt between the West Wing and outgoing Secretary of State Rex Tillerson. Allies of outgoing national security adviser H.R. McMaster tell me that Tillerson and James Mattis treated him with contempt and overwhelmed his role in the decision-making process. Bolton has always admired the way Brent Scowcroft handled the inter-agency process during the Bush 41 Administration, according to people familiar with his thinking. Some prominent Republicans and Democrats have raised concerns about Bolton's belligerent rhetoric in recent days, with some predicting he'll drag America into new wars. Here's a good example of a vigorous conservative defense of his appointment. Bolton also likes to quote a clash of world-views from the early 20th century. When Woodrow Wilson said the U.S. was entering World War I because "the world must be made safe for democracy," Teddy Roosevelt's "realist" riposte — of which Bolton approves — was that "first and foremost we are to make the world safe for ourselves." Behind the scenes: Trump has told a number of people he believes his current national security team has been out of whack with his own thinking and was slow to give him the options that he wanted. Trump blew up at his national security team last year because he thought they were boxing him in and trying to prevent him from following through on his instinct to withdraw from the Iran nuclear deal. Bolton, from outside of the White House, endeared himself to Trump last August by writing his own memo titled "How to Get Out of the Iran Nuclear Deal." Bolton told associates that the purpose of the Iran memo was to show that options on withdrawal from Obama's nuclear deal were possible — and that Trump's team weren't giving him those options. Much has changed inside the Trump administration since those early days when Trump's national security team — and Tillerson in particular — so enraged the president. This piece from WaPo's Josh Rogin — forecasting what comes next on the Iran deal and taking you inside the internal planning — is worthy of your time. Bottom line: As national security adviser, Bolton will make sure he provides "the range of options not only that are being recommended by people on NSC, but the options that exist in the real world," according to a source familiar with Bolton's thinking. "Even if nobody supports them, so that the president can see what's out there." Trump's Mar-a-Lago buddy Chris Ruddy made a splash on TV today, telling ABC's "This Week" that the president told him yesterday he expected to make "one or two major changes to his — to his government very soon." Ruddy went on to say that "other White House sources, not the president, tell me that Veterans Affairs Secretary David [Shulkin] is likely to depart the Cabinet very soon." Trump hasn't made any final decisions yet. The president has, however, lost confidence in the VA Secretary and is strongly inclined towards replacing him. Right now, Trump is happy to watch Shulkin twist in the wind for a while. Remember how unhappy we told you John Kelly and others have been about Shulkin's handling of internal problems in his department and especially his freelancing to the New York Times? A prolonged period of job insecurity and public humiliation is a uniquely Trumpian form of payback. The White House — specifically the president, Kelly, the White House Office of Presidential Personnel, and the director of Trump's Domestic Policy Council Andrew Bremberg — have been asking allies for names of people they'd recommend to replace Shulkin. Behind the scenes: Marvel Entertainment chairman Ike Perlmutter, another Mar-a-Lago friend of the president's, is playing a major backstage role in shaping Trump's thinking about Shulkin. Perlmutter originally recommended Shulkin to Trump, but a source familiar with his thinking tells me Perlmutter "feels betrayed by Shulkin and regrets ever putting his name in front of the president." Trump spent time yesterday with Perlmutter at Mar-a-Lago, and the two discussed various pressing issues at the VA, according to a source with knowledge of their meeting. Perlmutter has recommended at least one potential Shulkin replacement to the White House, according to two sources with direct knowledge. "Trump agreed with the recommendation of advisers... though they cautioned that Trump’s decision may not be final. "U.S. officials are working through the weekend to develop a coordinated response with the Europeans. What's next: Whatever action Trump takes could come as soon as this week, the source with direct knowledge tells me. Mike Allen reported yesterday that a former White House official told him online conservative ire (Laura Ingraham, Ann Coulter, Mark Levin, etc.). about the spending bill President Trump signed on Friday — after a puzzling tweeted veto feint — "is the hardest I've ever seen the base turn on Trump over anything." But the Cook Political Report's Amy Walter, one of the sharpest analysts of the nation's political map, tells me it's Republican House members who should be most worried about Trump's trashing of the $1.3 trillion spending bill. "I think those really at risk are GOP members of Congress. Trump can blame this on a process controlled by ‘institutional ‘ DC — not his fault. It’s just the latest example of a POTUS who is always willing to throw his own party under the bus to protect his own image. "This matters in a midterm when enthusiasm is already a problem for GOP." Short-term view: Amy Walter tweeted yesterday: "We'll know that the gun-control issue is politically potent one for Dems when they start campaigning on it in the swing CDs [congressional districts] they need to win control of Congress. National Journal's Ron Brownstein responded to Walter's tweet: "Not viable everywhere, but if they [Democrats] don't in the white-collar seats atop their target list, it would be political malpractice. Gun ownership much less common in suburbs & in latest NBC/WSJ 2/3 of people in households w/out guns disapprove of Trump & 2/3 plan to vote D 4 Congress." "Don't look now, but here comes the post-millennial generation...in their racial diversity, attitudes toward religion and culture, their digital fluency and their political priorities, this emerging generation — usually called the post-millennials, sometimes labeled Generation Z — might shake American life even more profoundly than the millennials. "For Republicans who have nervously watched polls showing an enormous backlash against President Donald Trump's insular nationalism among the millennials, this younger generation could represent an even greater threat. "By 2024 — just two presidential elections from now — the generation of young people that includes the students organizing a march on Washington next month to demand gun control will represent 1 in every 10 eligible voters." Defining the debate: "Most definitions of the millennial generation start with young people born in 1981. Some demographers, such as those at the Pew Research Center, say the millennial generation stops and the post-millennials begin with anyone born in 1998 or after; another, somewhat more widely accepted, definition starts the post-millennial generation with young people born in 2001 or after." The House and Senate are out on recess this week. Wednesday: The president hosts a credentialing ceremony for newly appointed ambassadors to Washington, D.C. He also has lunch with Pence and Defense Secretary James Mattis. Thursday: Trump will travel to Ohio "to promote his plans to rebuild and repair the nation’s roads and bridges," according to the AP.